In the daytime enjoy our spacial gardens, take a walk into bristol city centre and explore the new undercover shopping area, Cabot's Circus. Alternatively, take a short car ride to Cribbs Causeway Shopping Centre, Bristol Zoo, or take in the sites. You will surely appreciate the cities Georgian architecture, Brunel's Clifton Suspension Bridge and the recently developed harbourside. There are numerous activities nearby such as trekking, quad-biking, golf, horse riding and much more. We are just a short trip from Bath, Wells Cathedral, Cheddar Gorge, Wookey Hole and Glastonbury town. Bristol’s rich heritage has left the city with an incredible array of impressive attractions. 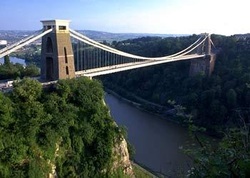 From Isambard Kingdom Brunel’s SS Great Britain to the exotic and unusual species of flora at Bristol Zoo Gardens, along with more recent additions such as the mind-bending Explore-@-Bristol. Bristol can proudly boast a collection of diverse attractions that will keep visitors entertained and engaged time and time again. Take advantage of temple Meads Station within a 10 mins walk from the mansion and the City of Bath in then just a 15 minute train journey away. 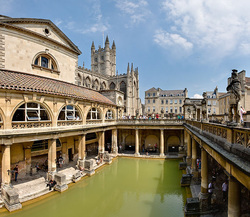 Bath has a diverse collection of museums and attractions, including the world famous Roman Baths and stunning Thermae Bath Spa.